Miriam was born in 1977 in Nkayi in Matabeleland, and finished school at O’level at Binga High School, Binga. Miriam did not do art at school, but she enjoyed illustrating her school with Science and Geography diagrams. She mostly lived with her father, who was a driver for a coal company in Hwange, before moving to Victoria Falls. Miriam remembers her father and appreciates that he insisted she learns and speaks English. Miriam has five sisters and three brothers. Miriam joined the Hippo Studio in 1996, when they were located at the crocodile farm in Victoria Falls. Today, at Hippo Studio, Miriam has developed a special interest in designing flowers, and focuses primarily on the development of the Floral line. 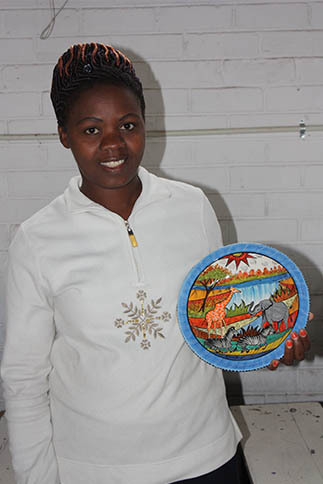 When she is not working on the blue and white of the Floral line, she finds time to also focus on the Mashona line, and especially loves to sketch and paint giraffe, zebra and elephants. Her preferred colour palette includes golden yellow, bright yellow and reds. Christopher was born in 1978 in Mutare in the Eastern Highlands, and finished his education at O’Level at Zimunya High School. Christopher’s father worked as a secretary at Mutare Girls High and his mother took care of him in the village. Christopher has three sisters and one younger brother. In 2000 Christopher joined Hippo Studio as a decorator, and today Christopher’s primary design focus at the studio is the Mashona, Matabele and Papillon lines. Christopher also enjoys the freedom of designing new pattern styles for the borders of his work. His favourite animals to draw are lion, cheetah and buffalo and his preferred colour palette includes golden harvest, yellow and red pepper. Although Christopher did art at school, he remembers his earliest struggle in the studio being that of handling brushes, something he had never worked with before. Christopher is proud of his work, and dreams of one day having a business of his own. Cleopas was born in 1972 in Mashava in the Masvingo Province, and finished his education at O’Level at Mashava Secondary Scool in 1991. Cleopas studied art at school, and remembers helping his teacher in the drawing of graphs and diagrams for the classroom presentations. Cleopas’ father was a farmer, growing maize, sorhum, wheat and groundnuts, and had herds of goats, donkeys and cattle. Cleopas helped his father during the school holidays in the herding and grazing of the animals and in ensuring they were safe from predators or thieves. Cleopas has five brothers and two sisters. 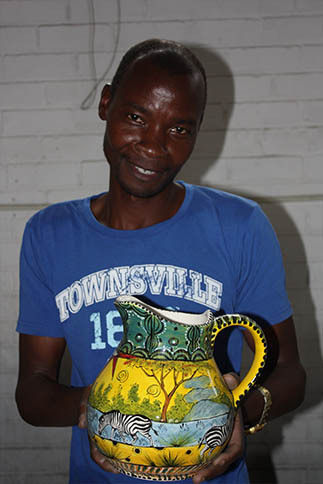 After leaving school, Cleopas joined other artists at Mzilikaze Art Centre, a government sponsored art centre. He joined Hippo Studio in 2011 when the centre closed-down. 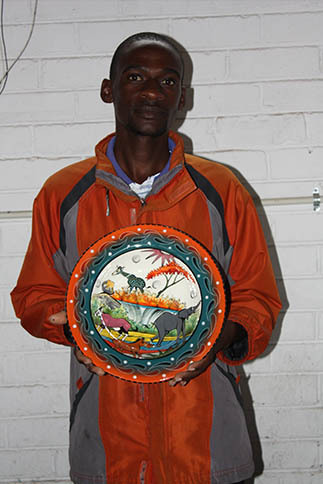 At the studio today, Cleopas’ main focus in on the drawing of animals in the Mashona and Matabele lines. His favourite animal to incorporate into his work is the impala, and his preferred colour palette includes turquoise blue, yellow and sea green. Cleopas’ main struggle in the concept of ceramic decorating has been the incorporation of outlines as accents or definition and has worked hard to try and master the subtlety of this design concept. Master was born in 1989 in Filabusi in Matabeleland, and finished his schooling at O’Level at Fort Rixon Secondary School. Master did not take art classes at school, and it was only when he joined the Hippo Studio that he discovered his interest in the arts. Master grew up with his mother at Fort Rixon. His mother raised Master and two brothers and three sisters as a single mother. The family network supported Master and his family during this time, and Master, through his work as an artist, is now able to help his mother and to help his brothers and sisters financially. Master joined Hippo Studio in 2008, and today he most loves to paint and design compositions with animals. His preferred colour palette are butter cream, turquoise blue and red. Master struggled with his drawing when he began at Hippo, to the point he almost quit his job. But, he explains, he worked hard and chipped away until he found his confidence in drawing. One of Master’s proudest accomplishments was when Hippo Studio was commissioned to supply Masterpiece Platters to the Captain, and team members, of the International Team at the 2017 Presidents Cup Golf Challenge, and his piece was selected as the studio’s winning piece. Master enjoys his work at the studio, and wishes to continue to grow in this studio. Gracious was born in 1998 in Bulawayo, and finished his education at O’Level at Gifford High School. Gracious discovered his artistic skills as far back as his primary school years, where the teachers began to ask him to draw the lesson presentation diagrams for them. He won his first Art Award in Grade 6 at Hillside Primary School. Gracious’ father left his mother when Gracious was only four years old, his mother remarried and Gracious has one sister. Gracious recalls how the cave paintings in the Matopos National Park became an inspiration for their simplicity and endurance. Gracious joined Hippo Studio in 2006, straight after finishing school, and has never looked back at his decision to start a career in art. At the studio, Gracious has been able to develop many styles, and together with Simon Back, developed the Beetle Line. In the much loved Chekari Collection, Gracious enjoys sketching the lethargic baboon and cavorting monkeys most of all. Gracious prefers to work with muted colours. 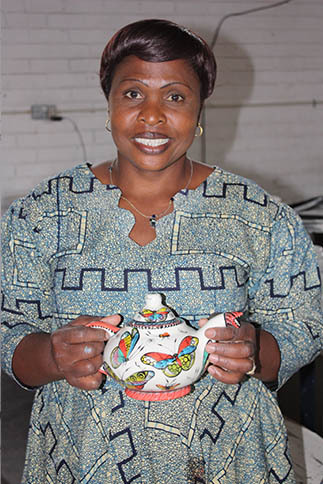 Gracious hopes to learn a lot more about art, and to achieve recognition and even to become one of Zimbabwe’s masters of art. Noleen is both decorator and the Supervisor at Hippo Studio. It is Noleen who undertakes the first quality inspection before the decorators’ pieces go into the kiln. Noleen was born in 1971 in Chegutu, and finished her education at O’Level at Chemkute High School. It was only when Noleen joined Hippo Studio in 1997 that she discovered a deep interest in art. Noleen’s mother and father worked in Harare when Noleen was growing up, and it was her grandmother that took care of Noleen and her three brothers and four sisters. There was a time when all thirty-two grandchildren lived with the grandmother. Noleen is married with three grown children. Noleen remembers her early days as a decorator at the studio and how hard she worked to improve her drawing skills: “It was tough, but I told myself it would lead to something better.” Noleen believes leadership is about setting the pace and helping other decorators when they are struggling. Noleen’s preference of Hippo Studio’s designs, is the Papillon Line, and when decorating the jungle motifs of the Chekari Collection, she loves to draw and paint the zebra. Her preferred colour pallete consists of Butter Cream, Yellow and Turquoise Blue. Clifford was born in 1979 in Marange Village, and finished his schooling at O’Level at Chirinda Secondary School in the Marange District. Clifford father practices polygamy and has three wives; Clifford’s mother being the second-wife. Clifford has two sisters and two brothers, and twelve half-brothers and sisters. Clifford’s father was a rich man who invested in cattle, while his mother did market gardening and made bricks. Clifford remembers sketching in his own time and his parents’ skeptism, being “old school”, towards his interest in art. 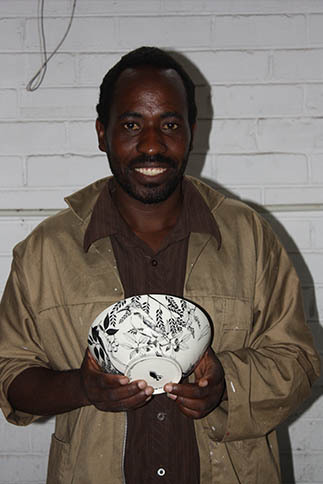 Clifford moved to Bulawayo to live with an aunt, and his enthusiasm and passion for art, opened the door to an opportunity to join the other artists at Hippo Studio in 2004. Today in the studio, Clifford is enjoying developing his skills drawing and painting birds in the newly introduced Bird Line. In the Chekari Collection, Clifford most enjoys incorporating giraffe, zebra and birds in his content, using a palette of Yellow, Red and Torquoise Blue. Clifford is engaged to be married, and hopes one day that he will be able to give his wife and children a happy home that can be sustained through his work as an artist. My father used to tell me in life that I must be a hard worker and to never rely on others – to work for oneself. I must be self-sustaining though my work. Tomeh was born in 1987 in Bulawayo. Tomeh was raised by his grandmother, who earned a living as a vendor selling tomatoes, and remembers the difficulties experienced by his family. Tomeh has one brother. Tomeh began drawing cartoon characters from the TV, and after leaving school Tomeh took his artistic talents to the streets, hoping to sell his work. It was there that he was approached to join the Hippo Studio’s artists in 2001, taking him off the streets and steering him towards financial independence. Tomeh enjoys working with the design concept of the Mashona Line, that is filled with landscapes, vegetation and wildlife of his country. The animal he most enjoys sketching and painting is the lion, and his preferred colour palette is that of Yellow, Golden Harvest and Turquoise Blue. Tomeh remembers his struggles as a young artist in the studio as being that of the sketching of animals and working with brushes. Joseph was born in 1981 at Kariyangwe Mission Hospital in Binga, and finished his education at O’Level at Kariyangwe High School. While Joseph had limited exposure to art at school, he recalls sketching during this period, and finding an interest in art. Joseph’s father was educated at a Missionary School (Kariyangwe Mission) and later did temporary teaching jobs and then went onto become a shopkeeper. Joseph’s mother also attended the same missionary school, and later became a village health-worker and then a first aid nurse at the local clinic, which grew into a hospital. Joseph has one sister and two younger brothers. In 2003 Joseph started working at Hippo. 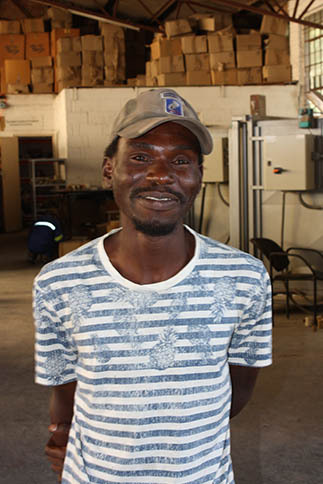 It was a difficult time for Joseph, leaving the provincial lifestyle of Binga to the city life of Bulawayo, but, he recalls the motivation he received from the owners of Hippo Studio at the time helped him cope with his new life. Joseph is married and has two children, and Joseph’s dream is to own a home. Today, in the studio, Joseph’s favourite design concept to work with is that of the Mashona Line, and is always challenged to think of new ideas to put into his interpretation of the designs. 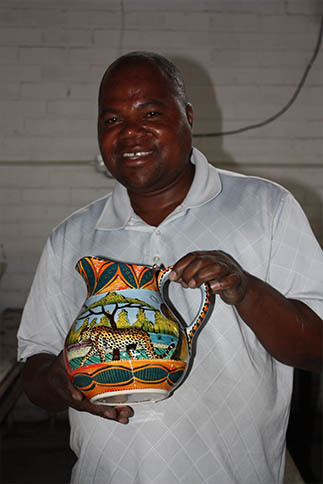 Joseph most enjoys drawing and painting elephants; the elephant is Joseph’s family totem. Beginning as a decorator, Joseph found working with a brush very difficult as he had only experience with pencil drawing. Martha was born in 1989 in Bulawayo and grew up in the Zvimba district in Mashonaland West. She had limited exposure to art at school, but she enjoyed drawing science diagrams in class. Martha’s mother is a farmer, and looked after Martha and two sisters in the rural areas. Martha’s father lived and worked in the city of Bulawayo as a Supervisor at a large asbestos company. Martha remembers her days in the rural areas, especially as an adult without a job as being very tough. 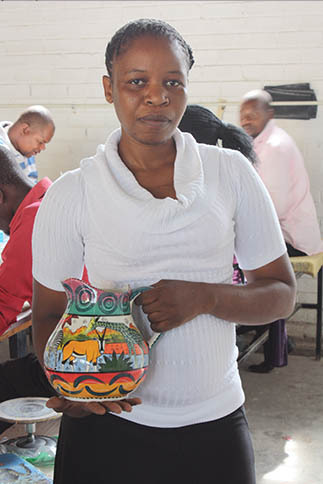 Martha joined Hippo in 2009, after following her sister to Bulawayo in search of a job, and has felt a positive transformation since finding a steady income as an artist. Martha wants to become a known decorator. Martha is married with two children. Today, at the studio, Martha prefers to work in the Blue and White Tribal Fusion line, where there is a strong focus on pattern and design. Martha takes her inspiration from everyday things, such as the patterns on fabrics. When decorating in the Chekari Collection she likes to paint zebra, and her preferred colour palette is Rose Pink, Sea Green and Blood Red. Martha struggled with the concept of sketching in the beginning, and laughs when she remembers some of her mistakes, such as placing kudu horns on a gemsbok. Martha feels motivated through the experimentation with designs, and trying to find winning design each new day gives Martha a sense of accomplishment. 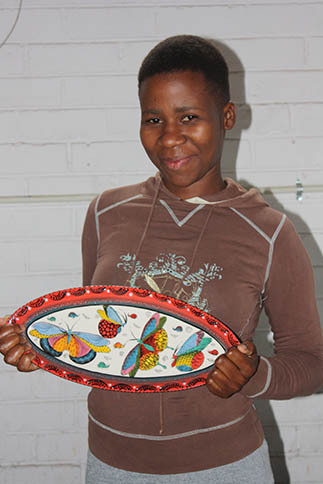 She is also proud to able to protect and look after her children and be financially independent through her work as a decorator at the studio. Linda was born in 1986 in a village called Chireva near Gokwe, in Mashonaland West province. She finished her schooling at sixteen years of age. Art classes were not offered at her school, but Linda’s interest in art began through her brother, who decorated the mud huts of their village. He sourced different mud types: white mud, red mud and black mud and painted the huts, with Linda helping him. Linda’s father was a subsistent farmer, growing maize, groundnuts, millets and cotton. Linda’s mother enjoyed the garden growing vegetables for selling. Linda started working as a decorator in 2007, it was her brother again, who opened the door to the opportunity to pursue her dream of becoming a well-known artist. Today, in the studio, Martha loves to work on the exuberant designs of the Mashona Line and her favourite animals to incorporate into her designs are zebra. Linda’s preferred colour palette is red, yellow and blue. Linda enjoys the feeling of accomplishment, and remembers winning the first “Piece Of The Week Award.” In 2010. 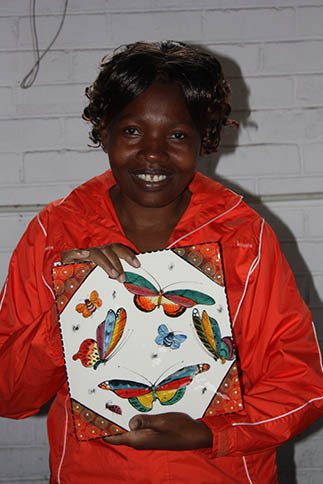 Linda is motivated to overcome her struggles, particularly the design concept that includes birds, and laughs when she remembers producing a three-legged elephant, which gave much amusement to her fellow artists when the inspector pointed this error out to her. Khulani was born in 1989 in Filabusi, in Matabeleland South province. 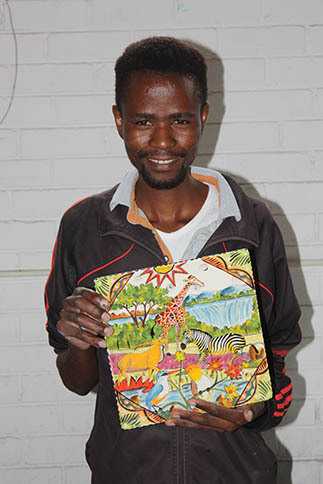 Khulani completed his education at O’Level, and was lucky to have been able to take Art classes to this level. 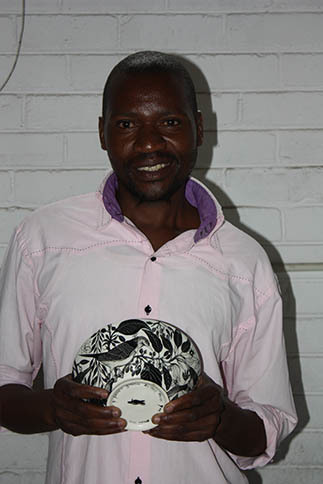 Khulani enjoys playing football and music; playing the keyboard and singing. Khulani describes himself as self-driven. Khulani lost his father in 1994, when he was only five years old, and his mother took care of Khulani and his four siblings. Khulani’s mother grew maize, but this was a perennial struggle because of poor rainfall in this area. Khulani joined Hippo Studio in 2007, where he started as a general hand; packing, sweeping, unpacking and cleaning. In 2009 Khulani decided he wanted to be trained as a decorator. 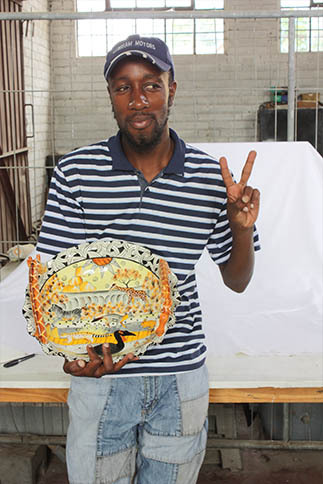 Today, Khulani loves most working the Mashona line design concept, and his favourite animal to incorporate into his designs is the giraffe. His preferred colour palette is comprised of Blood Red, Autumn Harvest and Baby Blue. Siphathokuhle Siziba was born in 1977 in the village of Lupane, and finished her education at O’Level at Amandlethu Secondary School. Growing up, Siphatokuhle lived with her mother and a brother and sister, while her father worked in Bulawayo. Siphatokuhle’s mother was a subsistent farmer, also managing goats and chickens and cows independently. Siphatokuhle’s father worked at Hippo Studio and invited her to join the studio as a decorator in 1997, she had very limited experience with art at school, and after a training period, she grasped the drawing, brushwork and colour skills very quickly. In the studio today, Siphatokuhle’s favourite design concept is the Papillon line, for its loose, whimsical style of design. Her favourite palette of colours to work with are Citrus colours, blues and reds. Siphatokuhleokuhle recalls her personal journey as an artist as one who knew nothing, but she did not let this make her despondent or negative, instead she focused hard at learning new schools. When asked of her aspirations, she looks forward to a secure retirement surrounded by grandchildren, and telling them the story of her life as a ceramic artist. Sikhunjulwe was born in 1978 in Lupane. She finished her education at O’Level at Amandlethu Secondary School. She loved mathematics, and playing with her friends after school, before she went to home to help her mother in the fields. Sikhunjulwe and her family attended the Roman Catholic church every Sunday, and then enjoyed their Sunday lunch of sadza (a stiff, corn porridge) and chicken. It was after her father asked her to join Hippo in 1997, and she was trained that she discovered her artistic talents. 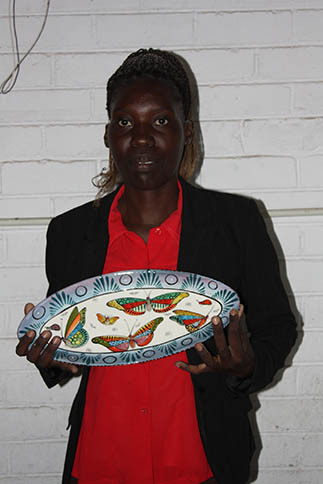 She remembers the very first plate she decorated and signed with such happiness and pride, and is enjoying the economic independence that her artistic talents have brought to her, and the ability to take care of her five children. Sikhunjulwe prefers to work on the Papillon and Tribal Fusion design concepts and her favourite colours to work with are bright yellow, red pepper, turquoise blue. Sikhunjulwe’s favourite animal to sketch and paint is the giraffe. Sikhunjulwe has worked hard to overcome her struggles with new design concepts, and her proudest accomplishment has been when one of her pieces was selected as Piece of The Week in 2003.